VIVA ICC! VIVA Channel 97! Do you remember our VP Marty Grund's "A call to action"? Marty met Joseph Ocol at the SuperNationals in Nashville, Tennessee, and was struck by the passion and dedication of this humble math teacher, who out of his mere teacher's salary bought food and chess sets to teach chess after school, thus keeping them off the streets during dangerous hours of the day. These kids, all African-Americans, come from the west side of Chicago, whose families are unfortunately below-poverty level. Raised by mainly single parents in neighborhoods one cannot walk to a bus stop without crossing through several dangerous gangs turf, their daily lives are seriously challenged. Sometime in 2005 when I started the chess club at Marshall, after one of my students was shot dead, my only intention was to save lives of our kids by getting them in school after school between 3 and 6 pm. The chess club opened a new paradigm for the kids, an opportunity to develop not just their skills but their self-confidence and give meaning to service to others. Kids became more involved in helping others by sharing with others their skills and talent on chess. In 2010, Marshall kids began mentoring kids from Faraday Elementary School. Yes, we called it "Student Can Teach" program because there's something in the saying that you get to master a skill if you teach that skill. Back home, Marty decided to call to action the chess community in order to help Joseph and his kids. Well, guess what? It was a big success! The politics debate channel, within ICC, is the most active chat channel in the entire community. Usually a very partisan group vehemently arguing their political position came together as one quickly raising enough money to put the kids fund-raising over the top for their quest to participate in Nationals. No matter what political stance one took this was one cause that, not surprising to Marty, brought everyone together. They responded to the call, donating and sharing Marty's feelings about this 'saint' math teacher and his kids. 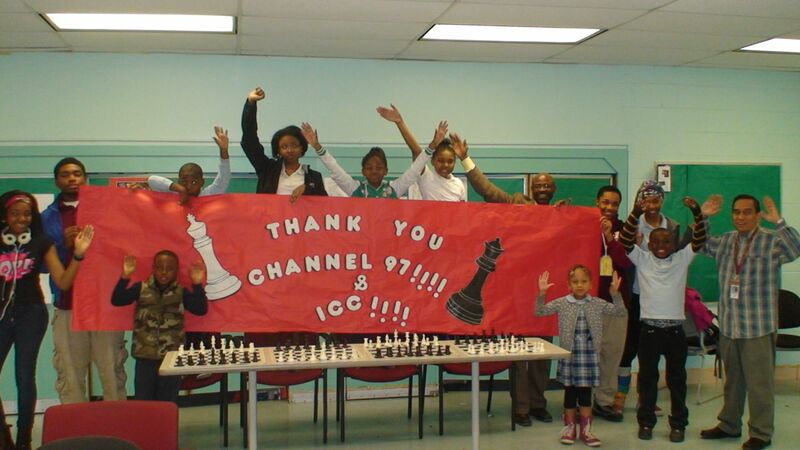 With the support of ICC and channel 97, the kids were able to participate in the 2014 United States Chess Federation Nationals Chess Tournament, and they did SUPER! Also, on April 13th three girls from Faraday Elementary School won the national championship trophy for the Under 16 Years Old Section. Joseph said, " I don't think this ever happened before. It's not just local, not just state, but national championships, our kids have become champions in the whole USA. Two national championship trophies in two weeks. All by kids from west side of Chicago! Who would of ever believed that our underprivileged schools would of produced 4 National Champions and if it were not for channel 97 and ICC's support, it would never have happened"! Here is a nice photo with our VP Marty Grund and the "band". 1st Row - Left to Right: Marty Grund, ICC VP; Ty Cratic, Chief of Staff; Aerious Adams, 3rd Grader, Faraday; Jacquez Adams, 3rd Grader, Faraday; Armon Adams, 3rd Grader, Faraday; Mikayla Phillips, 4th Grader, Faraday; Taylor Watts, 8th Grader, Faraday; Patricia Bess, parent; Andrea Box, parent and officer of the Marshall Alumni Association. 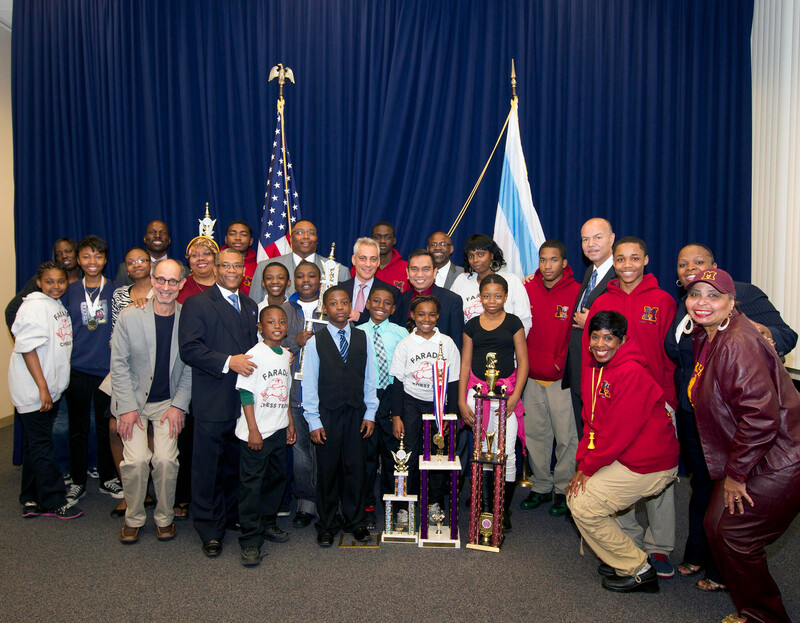 2nd Row - Left to Right: Taylor Phillips, 5th Grader, Faraday; Lamari Childs, 8th Grader, Faraday; Tiara Fearon, 8th Grader, Faraday; Earlean Green, parent; Darrell Taylor, 6th Grader, Faraday; Antoine Christopher, 6th Grader, Faraday; Mayor Rahm Emanuel; Joseph Ocol, chess coach Marshall and Faraday; Charlie Wiley, 10 Grader, Marshall; Angel Johnson, Principal of Marshall High School. 3rd Row - Left to Right: Carol Blankenship, parent; Khalid Oluewu, teacher administrator; Michael Hobbs, 10th Grader, Marshall; Alderman Jason Ervin; Bobby Blankenship, 11 Grader of Marshall and national champion U800; Cederall Petties, Principal of Faraday Elementary School; Latonya Hargrays, parent; Bradley Green, 12th Grader, Marshall Chief of Staff of Mayor's Office. 11th Grade Marshall student and Faraday alumnae, Bobby Blankenship, placed 1st in a field of 143 students in the K12 Under 800 section with 6.5 wins out of 7 matches. 10th Grade Marshall student and Faraday alumnae, Michael Hobbs placed 13th in a field of 143 students in the K12 Under 800 section with 5 wins out of 7 matches. 9th Grade Whitney Young student and Faraday alumnae, Kiana Hobbs placed 77th in a field of 221students in the K-12 Under 1200 section with 4 wins out of 7 matches. 6th Grade Faraday student, Darrell Taylor placed 75th in a field of 143 predominantly high school students in the K12 Under 800 section with 3.5 wins out of 7 matches. 5th Grade Faraday student, Taylor Phillips placed 82nd in a field of 143 predominantly high school students in the K12 Under 800 section with 3 wins out of 7 matches. 7th Grade Faraday student, Lamari Childs placed 84th in a field of 143 predominantly high school students in the K12 Under 800 section with 3 wins out of 7 matches. John Marshall High School placed 13th of a field of 28, with a TEAM of 2 players against TEAMs comprised mostly of 4 or more players. Michael Faraday Elementary School placed 21st of a field of 28, with a TEAM of 3 players against predominantly high school TEAMs of 4 or more players. Such a great success makes it worthy to be part of a thriving chess community like ICC, and we all feel so proud of these kids and their fantastic coach. Here is what Joseph Ocol wrote to our VP Marty Grund. It's moving. You just don't know how much happiness and fulfillment you have done for our kids. This is the reason I am now calling you Saint Marty, because you are indeed the saint who touched their lives and made a difference and continues to make a difference in their lives. 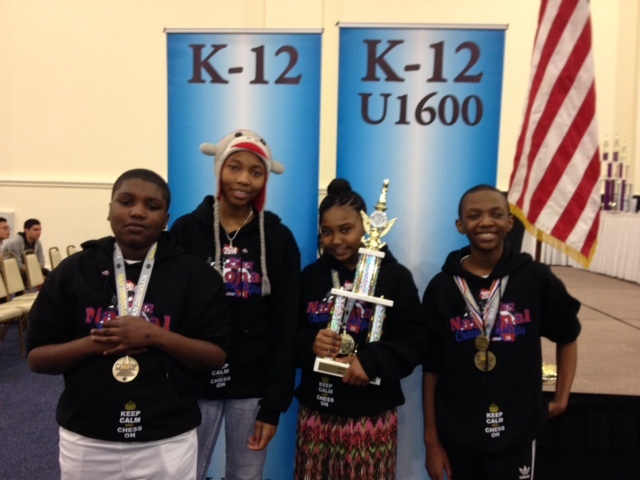 Through your efforts, our Marshall--Faraday chess team was able to go to San Diego for the 2014 Chess National Tournament. Who would have thought we would be able to go to San Diego and participate in a National Chess Tournament, our first ever to attend a national tournament. But you have always believed in the kids; you have always believed in our chess program. You made the impossible possible. For that, and in behalf of the team, I will truly and eternally be grateful to you. Thank you very much, Saint Marty. For what you did, Marshall-Faraday was able to produce the first ever National Chess Champion. Bobby Blankenship, a junior (Grade 11) at Marshall, was undefeated after 7 rounds and won the National Champion trophy for Under 800 Section. Out of 143 participants in that section, he came out the top, the only African-American, other than Michael Hobbs, in the top 20 of that section. Michael Hobbs, the other Marshall student (a sophomore), came out No. 11 and won the 11th Place trophy in that national tournament. Marshall team was handicapped when it played. There were only two players for Marshall competing against moneyed schools, some of which had 11 or 9 players. Yet despite the odds, Marshall had only one loss to emerge No. 13th and won the 13th Place trophy in that national tournament. I am sure that Marshall could have placed in the top 3 had we sent a full contingent of players. But budget was really the problem, so we would rather have two players to make do with whatever we had financially then. Still it was worth it. Faraday, with four players, came out No. 21 and won the 21st Place trophy. All these would not have been possible had it not been for you. WE NOW HAVE A NATIONAL CHAMPION AT MARSHALL, SAINT MARTY! The best in the whole United States. We made history, thanks to you! Marty, and all the ICC staff, want to say a big THANK YOU to all those who have donated, selflessly, to make this 'miracle' happen!